White crab meat with a mustard and dill sauce and a citrus fish stock. Two luxurious servings of white crab with a classic mustard and dill sauce. High in omega-3. Great for lunch on its own or served with rye bread. Introducing our indulgent crab terrine. 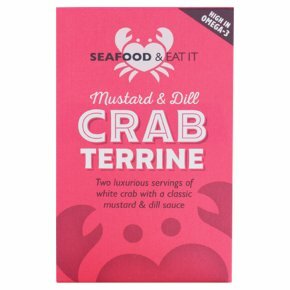 Made with the finest native crab from Cornwall and the British Isles in a classic mustard & dill sauce and a citrus fish stock. Perfect for lunch with rye bread.